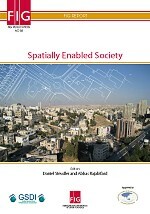 Joint publication of FIG-Task Force on "Spatially Enabled Society"
This publication on “Spatially Enabled Society” is the culmination of a three-year effort by the Task Force that was established by the General Assembly of the Federation in May 2009. The Task Force included representations from the Global Spatial Data Infrastructure Association and Working Group 3 of the United Nations sponsored Permanent Committee on GIS Infrastructure for Asia and the Pacific. This is a collaborative effort led by the FIG Task Force and the publication has been compiled and edited by Dr. Daniel Steudler, Chair of the FIG Task Force on Spatially Enabled Society, and Prof. Dr.
Abbas Rajabifard, President of the GSDI Association. with information on land ownership and custodianship, in a consistent manner to underpin good governance of land and its natural resources, whole-of-government efficiency, public safety and security towards the well being of societies, the environment and economy. The main issue societies have to focus on is probably less about spatial data, but much more about “managing all information spatially”. This is a new paradigm that still has to be explored, deliberated and understood in the context of a spatially enabled society. This collaboration between FIG and GSDI is within the aim of the MoU signed in 2010 between these two professional bodies. Together with PCGIAP WG3, this collaboration has allowed for the participation and contribution from contributors and authors with varied expertise, from differing backgrounds and in different regions of the world. We would like to congratulate the FIG Office, members of the Task Force, all contributors, all co-authors and the two editors for this superb effort. We extend the deep appreciation and gratitude of our Federation and Membership for their invaluable and unselfish contributions. with cadastral map overlay from Switzerland.